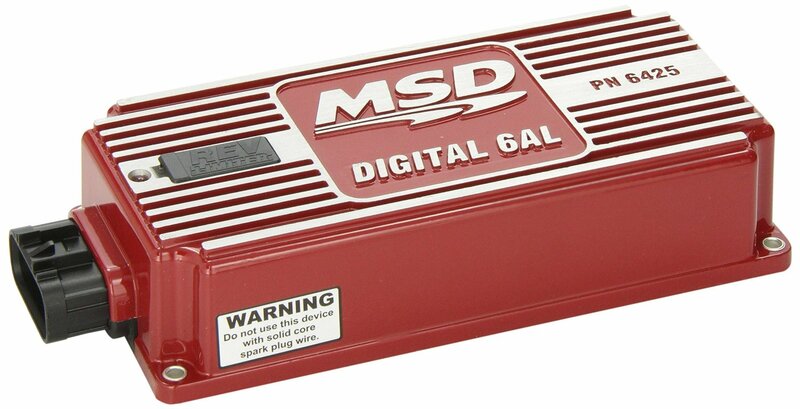 The digital 6AL shares the same proven circuitry of the 6A with the addition of a built-in adjustable rev limiter. The combination of powerful sparks with the safety of a Soft Touch Rev Control is what makes the 6AL the most popular ignition control in the world. MSD first developed the Soft Touch rev control to prevent overrev damage to your motor in the event of a missed shift or driveline failure. The rpm limit is adjustable in 100 rpm increments with the turn of the two rotary dials, which means no more modules to keep track of. When the engine reaches your selected limit, the Soft Touch circuitry begins dropping the spark to various cylinders. On the next cycle, these plugs are fired again to prevent fuel from loading up in the cylinder. The result is a smooth and accurate limiting action without backfires or roughness. These digital 6AL ignition controllers are sleek with a lower profile, also the wires are now routed into one quick disconnect sealed connector.